Michael Palasciano was born in Dallas, Texas, and graduated from The Highlands School. He attended Texas Tech University where he majored in Political Science with a minor in English and graduated in 2006. Afterwards, Michael attended law school at St. Mary’s University School of Law in San Antonio, Texas where he graduated with his J.D. in 2010. In law school, Mr. Palasciano worked as a student attorney at the St. Mary’s Center for Legal and Social Justice, working on Violence Against Women’s Act and deportation cases. Michael has lived all over Texas – Dallas, Lubbock, Austin, San Antonio, Houston and Corpus Christi. In law school, Mr. Palasciano worked as a student attorney at the St. Mary’s Center for Legal and Social Justice, working on Violence Against Women’s Act and deportation cases. 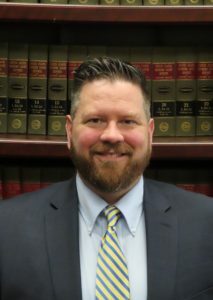 Following law school, Michael continued to work representing underserved clients in the areas of Social Security Disability and Personal Injury across the state. In October 2015, after working to represent underserved clients across the state, Michael began working for a firm in San Antonio where his focus was on Personal Injury cases. Michael moved back to San Antonio in October of 2015 and continued working in Personal Injury. His love of Personal Injury eventually led to him to joining Gireud Hobbs in order to combine their passions and experience to provide the best possible representation in the fields that most significantly affect their clients. Outside of work, Michael enjoys playing soccer and cheering on his Texas Tech Red Raiders to wreck ‘em. We had a great experience with Mr. Gireud who helped us with our immigration case. He explained everything in great detail and gave us insight on all of the scenarios that could play out. We are very satisfied with the service that he provided. Fernando was recommended to me through a friend of mine who also hired him as his immigration attorney and has already got his green card. Sure enough, just like what my friend described, Fernando definitely proved his excellence in the law and successfully helped me get through the N-400 Naturalization case. I'm very glad that I made the right decision and will highly recommend him to anyone who wants to look for a professional, experienced and hardworking immigration attorney! I would recommend him to anyone who needs an excellent immigration lawyer. Successfully Dismissed Case - Colin handled my case with an exceptional level of professionalism from the moment I first spoke to him on the phone. I was initially not very optimistic about my case on account of having prior un-related, and unfavorable legal encounters that could have worked against me. But my experience with Colin was different. He lucidly explained every facet of my case and engineered a well thought-out legal strategy that he put into motion right away. The level of service I received from Colin and his team was exceptional. Once his strategy was in place, the only encounter I ever had with the court was to show up to announce my name in attendance - the rest was all Colin. It was really that simple. I highly recommend Colin and his team. Thank you for all your hard work Colin. Assault - Dismissed I hired Mr. Colin for an assault case a while back. I was really scared because I'd never been arrested before but a friend gave me his phone number and said he knew his stuff. He asked me a lot of questions, explained the process and helped me gather evidence against the other which convinced the DA to dismiss the case because I was just defending myself! Fantastic Attorney! Last year I was charged with DWI with a breath test of .18 - at first the prosecutor wasn't willing to offer anything less than 2 years probation on a DWI based on my criminal history and the breath test results. Mr Hobbs convinced the prosecutor to watch the video there in court while I was in the courtroom. He managed to get a 6 month deferred probation offer on a Class B Obstruction of a Highway which is MUCH better than a DWI and eventually will get dismissed. Since I won't have a conviction I was able to keep my job and while I hope I don't need him again, he'll be my first call if I do!